As we head into 2017, we're giving 2016 one last look. From a faux "leather" made from fermented tea to a 3,000-year-old ball of yarn, here are the stories our readers read, shared, and discussed the most. 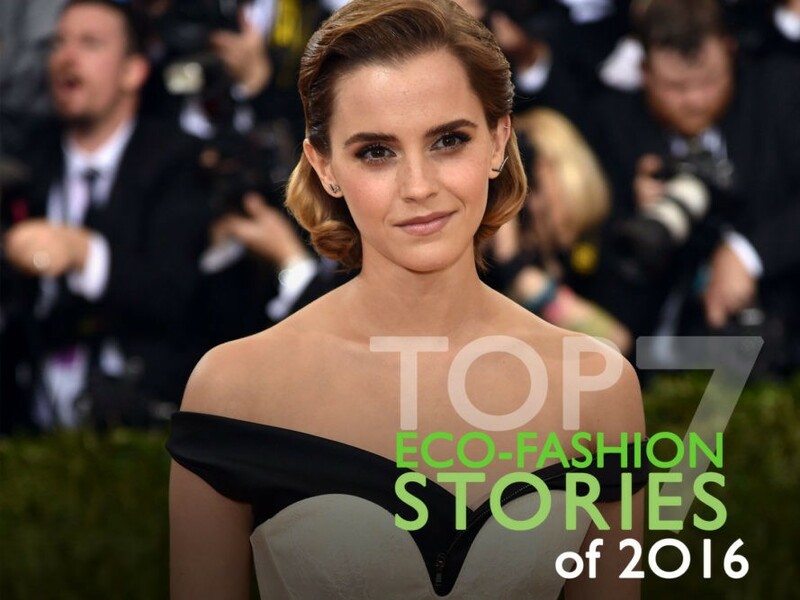 Above, actress-activist Emma Watson attended May's Met Ball in a Calvin Klein for the Green Carpet Challenge–designed menswear-inspired ensemble derived from 100 percent post-consumer recycled plastic bottles. True story: Archaeologists in England just unearthed a 3,000-year-old—and extremely fragile—ball of yarn. Buried in the waterlogged depths of the Must Farm Bronze Age settlement, a site in Cambridgeshire that has been described as the “Pompeii of the fens,” the artifact is one of a rich cache of finds that includes textiles, beads, and domestic tools. Like other fibers discovered at the location, the yarn is probably plant-based in origin. MuSkin is a 100 percent biodegradable vegetal leather, extracted from mushroom caps and “tanned” using chemical-free methods. It Resembles suede but is “much softer,” according to Italy-based textile manufacturer GradoZero Espace. The company also describes the material as breathable, pliable, naturally water-repellant, and suitable for direct contact with human skin. A group of women in Tennessee have transformed more than 52,000 used plastic bags into waterproof sleeping mats for the local homeless population. Hailing mostly from the Second Baptist Church in Union City, the self-described "Bag Ladies" came into being in January 2015 when a man told the congregation about homeless people sleeping along the Mississippi River. The process of making the mats can be addictive, said Janice Akin, a member of the group. "It gets to the point that you do two or three and you say, 'Hey, I'm actually making a difference in someone's life,' and you want to do more," she told WGNTV.com. The Pussyhat Project is looking to put a pink cat-ear hat on the head of every woman, feminist, and ally at the Women's March on Washington on January 21. Founded by a band of knitters, the Los Angeles–based outfit wants to provide activists with the means to present a "unique collective visual statement" as they protest Donald Trump's divisive rhetoric one day after he's sworn in as America's 45th president. Even seasoned models have been known to take a spill or two on the runway. We're only human, after all. For the fashion brands behind them, however, the onus not to stumble weighs a little heavier. With Greenpeace's 2020 "Detox" deadline fast approaching, the environmental group decided to check in on 19 of the companies that have committed to eliminating hormone-disrupting industrial chemicals, including 11 priority groups Greenpeace has identified, from their supply chains. The third edition of its "Detox Catwalk" reveals that not all is smooth strutting.